An annual which grows to 60cm high. Four petals, flower 30-70mm across. 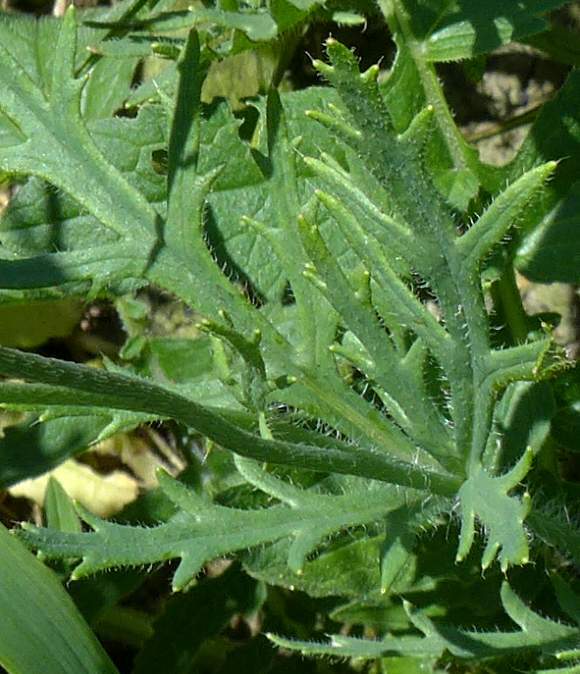 The stem hairs are, like those of the larger Oriental Poppy, appressed (flattened against the stem) in an upward direction, but only just below the flower-head; much lower down they are directed outwardly. 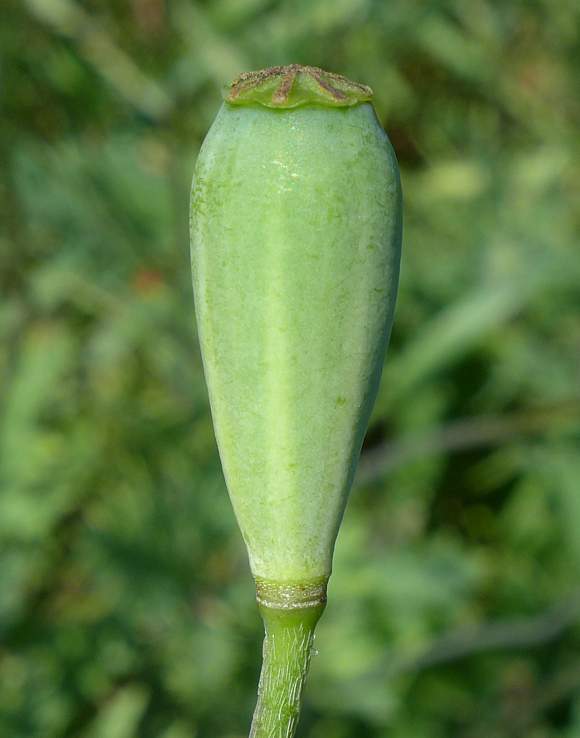 The seed-head is long and tapers in a convex curve to a much narrower base. With numerous dark-brown filaments supporting brown anthers with yellow pollen surrounding the developing seed-head atopped by a green (at first) membranous style with between 7-9 rays (can be as low as 4 and as high as 12). 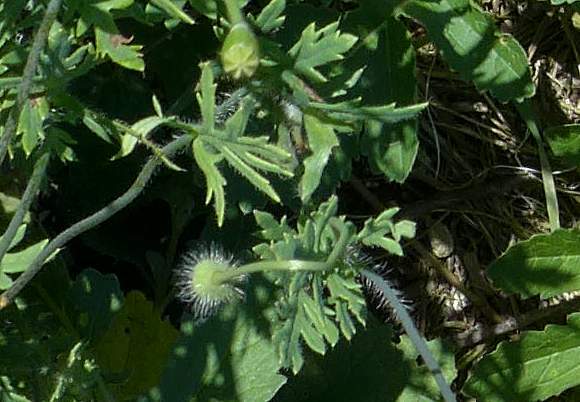 Developing seed-head has lost its 4 petals and the style is now slightly less wide than the top of the seed-head. The style with rays which have turned from yellow to brown. Here with 7 rays. 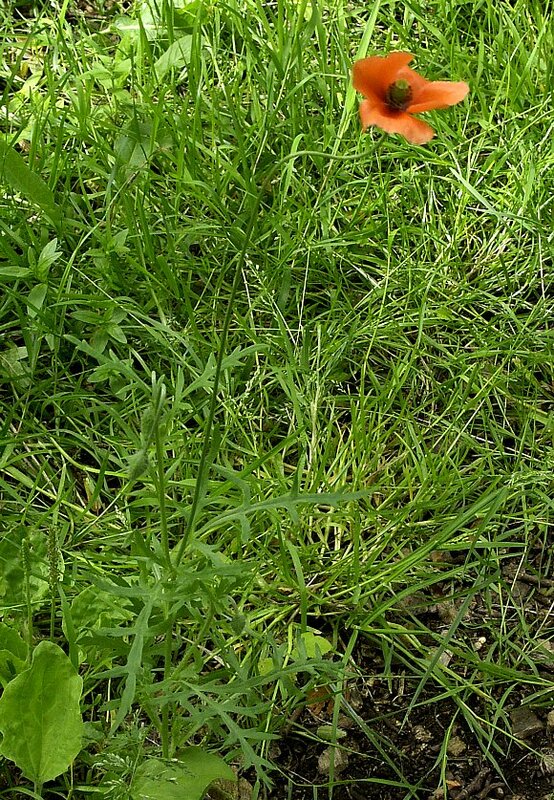 Some developing seed-heads in this photo have between 7 and 8 rays, though your Author saw one with just 6 rays. The leaves are narrow, oblong and divided. The leaves are oblong and divided. Note the un-opened flower-head which is drooping and has many long white hairs. 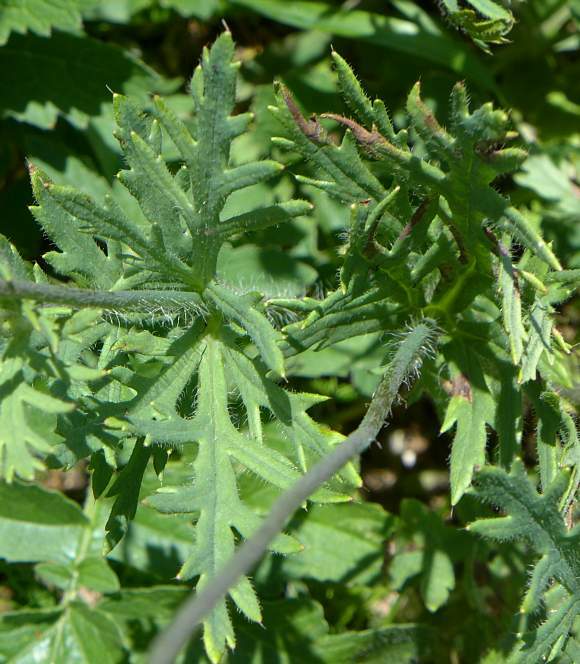 Deeply-lobed leaves, hairs not appressed lower down, but sticking out. 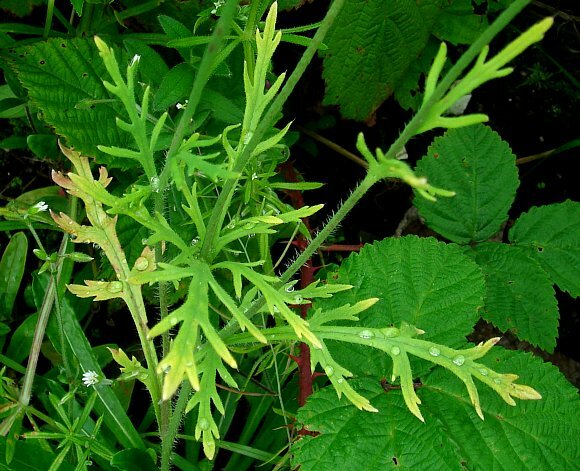 Leaf-tooth tips have hydathodes and a long bristly hair at the end. 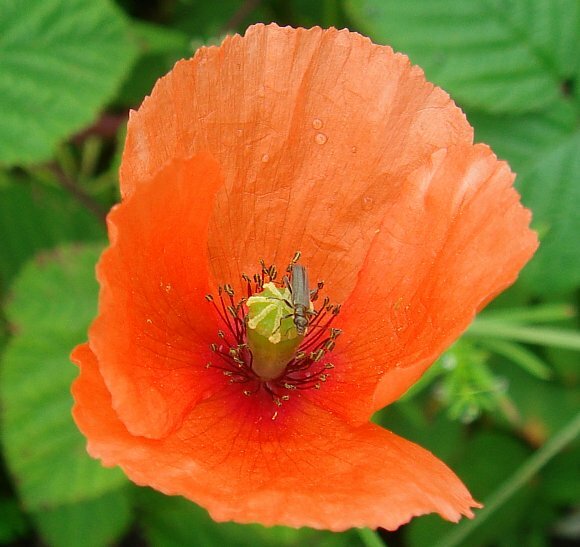 Hybridizes with : Common Poppy (Papaver rhoeas) to produce Papaver × hungaricum which is sterile. 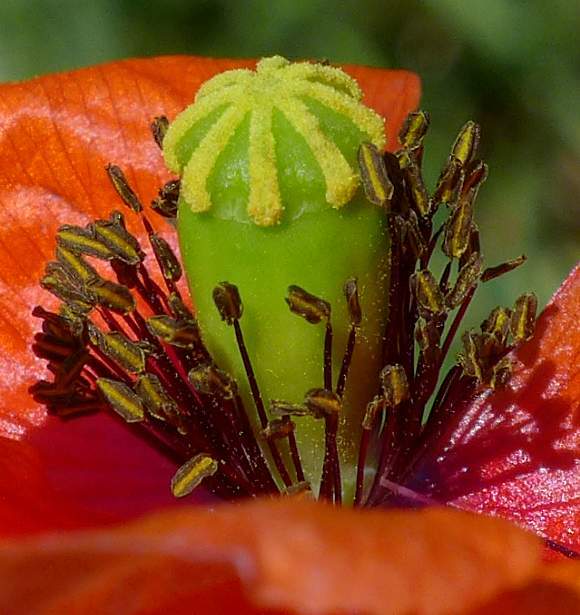 Could be mistaken for Atlas Poppy (Papaver atlanticum) which also has four orange petals of similar size and long narrow seed-heads but there the seed-heads are knobbly near the top and do not bulge out wider than the stigma disc as they do on Long-headed Poppy. 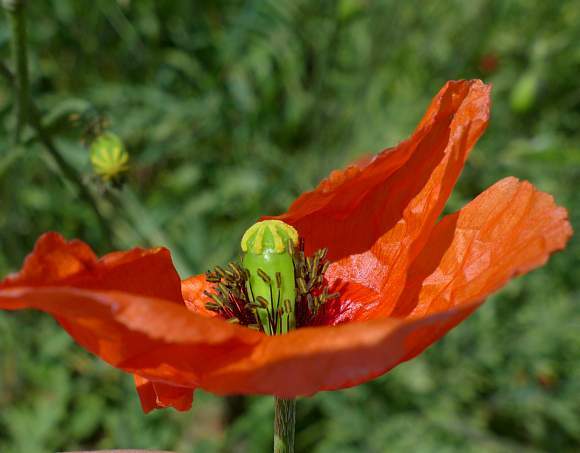 Slight resemblance to : Common Poppy (Papaver rhoeas) but that has a shorter seed-head that is also more rounded and does not narrow so much at the bottom in a slow slightly-bulging taper. 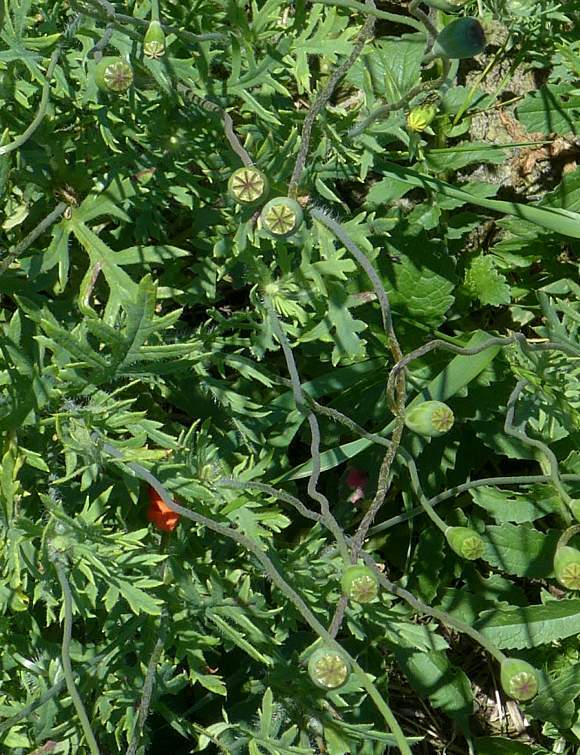 This annual plant is an archaeophyte and grows in similar places to Common Poppy (Papaver rhoeas) such as arable ground, roadsides and waste places. 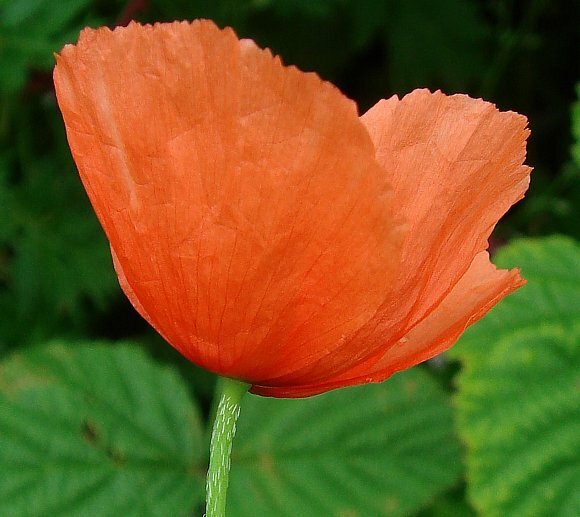 It occurs throughout the British Isles but is rarer than is Common Poppy in the South and East, but more numerous in the North and West where your Author walks. When the stem is broken a white or cream-coloured latex oozes out which turns brown or black when dry. 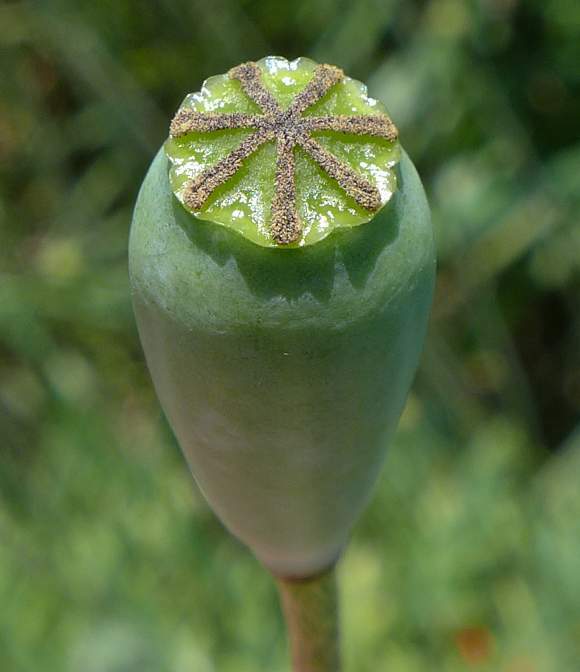 Taxonomically, there used to be a sub-species of Papaver dubium called Papaver dubium ssp. 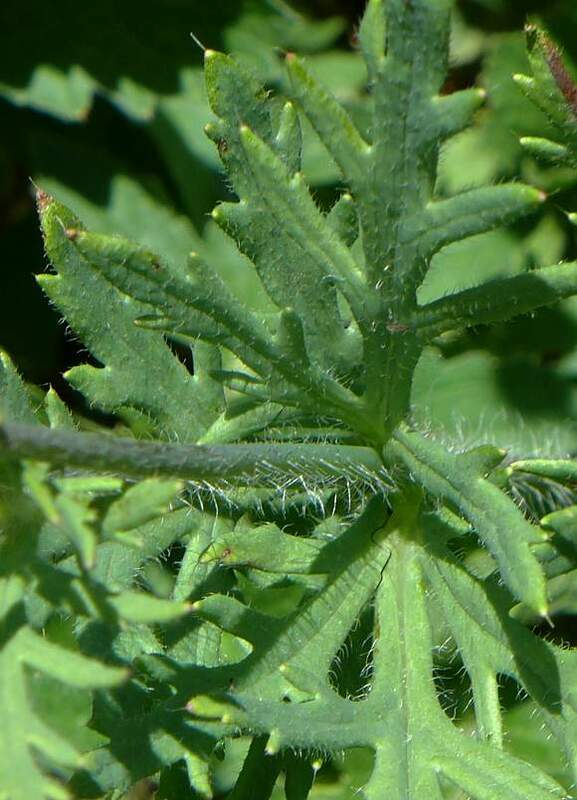 lecoqii but this has now gained new species recognition and is instead called Yellow-juiced Poppy (Papaver lecoqii) which is scattered throughout England Wales and Ireland but in the South is frequent only on chalk soils. When the stem is wounded, it yields has a latex which at first is yellow (or turns from clear to yellow very quickly) before turning reddish as it dries. It is indeed possible that the two photos above from the Tyldesley Loop Lines taken on the 6th July 2005 is of Yellow-juiced Poppy since that has narrow leaf lobes, but we will never now know for sure since your Author did not know 16 years ago to look at the colour of the latex as it dries... And would he have had the patience to wait until it dries if he had indeed known. 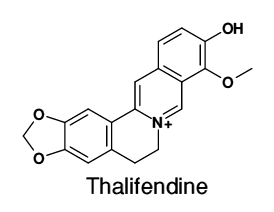 Roemarine , previously called Aporeine because it belongs to the Aporphine group of alkaloids, is a toxic isoquinoline alkaloid found within the petals of Long-Headed Poppy and which is structurally similar to Bulbocapnine found in Yellow Corydalis and to Glaucine found in Greater Celandine, which is also a member of the Poppy Family. 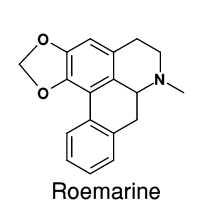 Roemarine resembles Thebaine in its action and is a pharmaceutical used in cases of pneumonia. 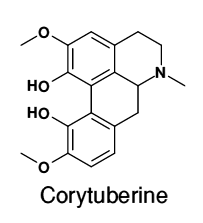 AlloCryptopine is just Protopine with the top ring broken. 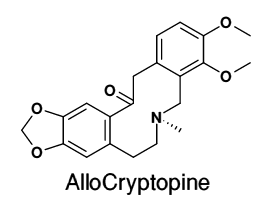 AlloCryptopine gains an Allo prefix because is allotropic, crystallising in two differing forms, the melting point temperatures of the two differ by 10C with the α-Cryptopine melting at 170C whilst the β-Cryptopine melts at just 160C. The =O atom opposite the nitrogen atom has broken the a bond fusing two hexane rings together resulting in a 10 membered ring taking the place of two 6-membered rings. 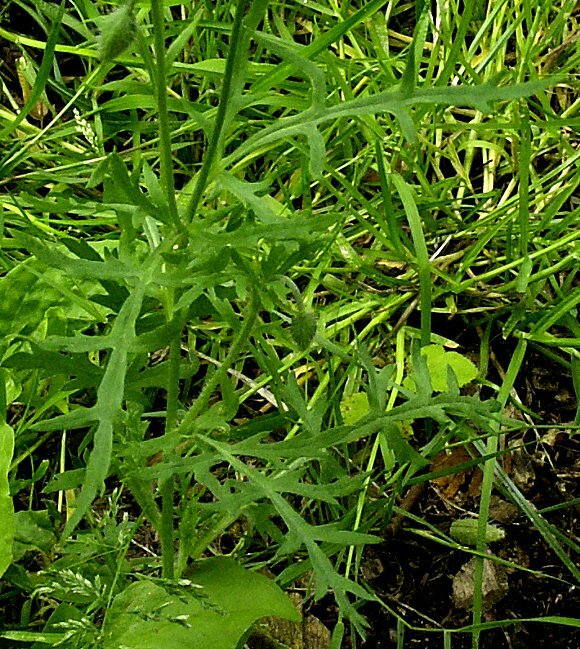 Both allotropic forms are found in Opium Poppy. 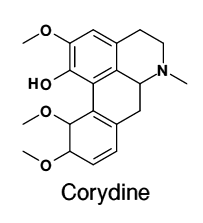 Just for comparison, your Author includes the structure for Cryptopine, which is not reportedly found in Long-headed Poppy, but your Author just wanted to show that the only structural difference between the two are that the end-groups have swapped places. 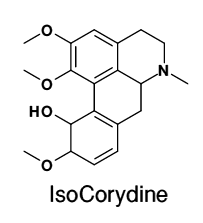 Cryptopine and AlloCryptopine are therefore also isomeric, with the same empirical formulae, C21H23NO5.